Although fresh is best, it is a chore to open and chop so many calms and in many places they are not easy to find, so using canned ingredients is certainly acceptable. I think that the two secrets to a great Manhattan clam chowder are a great clammy taste and a lot of thyme. This recipe will give you both with easy to use items from your cupboard. I like to use a large straight sided sauté pan to make this recipe as it makes cooking the vegetables easier, just make sure it's large enough to accommodate all the ingredients. 1. Open the cans of clams and using a sieve drain the juice of the clams into a bowl, place the clams in a separate bowl and set aside covered in the refrigerator. 2. In the pan heat the olive oil to medium and then add the onion, celery, and carrots and about 1 tsp of salt and pepper each and cook until the vegetables are wilted but not browned. 3. Carefully add the tomato, pepper flakes, bay leaves, 2 tbsp thyme, potatoes, and the juice from the clams and simmer for 45 minutes to an hour until the potatoes are cooked through. 4. Just before serving add the clams. Taste and adjust seasoning at this time. If not clammy enough add a little of the clam juice, not enough thyme add more and if needed adjust the salt and pepper. 5. 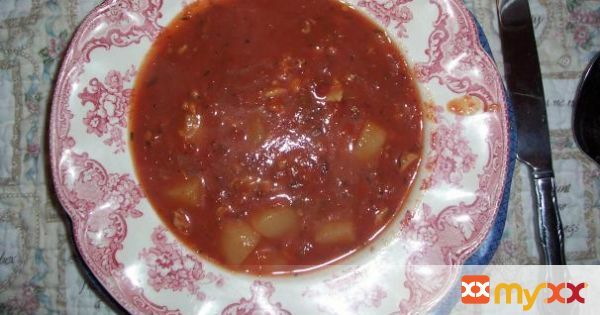 Makes a great soup course or a filling meal served with Scottish Scones: http://www.rantsravesandrecipes.com/scottish-scones/.